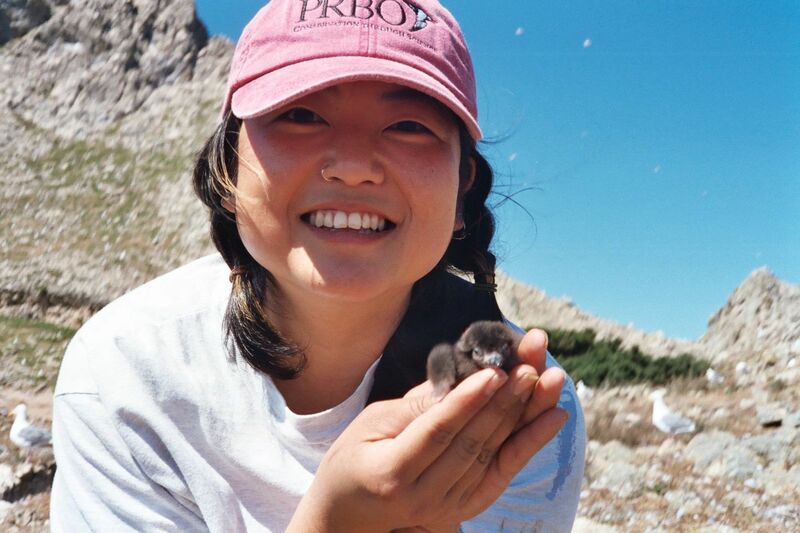 Senior Thesis: Adult prey preference in the pigeon guillemot (Cepphus columba) and effect on chick growth, at Southeast Farallon Island, California. Work experience: I have taught marine science, done fieldwork with seabirds, worked for various labs at UCSC and MLML and lead natural history/whale watch boat trips from San Francisco. A: I am the first person in my family to go to graduate school, and also the first to go to college. I grew up on a farm, where my parents and extended family grew carnations for a living. We had lots of time to play and explore the nursery, plants, bugs and frogs, but there was no one to teach me about science, and what cool things science encompasses. As a kid I never considered science as a career- with my limited exposure I thought a scientist wore a lab coat and held an erlenmeyer flask! It was not until I became an adult that someone introduced me backyard birds, which started me on my journey to rediscovering nature and the ocean. After I graduated high school, I went to community college for a couple years but didn’t have any direction. I was under the misconception that the major I decided on would determine what I would do for the rest of my life. Frankly, I was scared of making a mistake- of making the wrong choice. Later in life I learned that a single decision or choice cannot ruin my life. It is all about perspective – how you see the situation you are in and focus on the positive aspects of it. Every opportunity, even the bad ones, has been an opportunity to learn and grow. When I was 19, I agreed to take over a family business, an established and successful retail flower shop, which I operated for number of years. While I loved designing floral arrangements, working with fresh flowers, and with people, it was not satisfying my soul. I longed to make a difference in the world, mainly the marine environment. While I was volunteering in wildlife and marine mammal rehabilitation, I saw first-hand, some of the human-caused injuries animal suffer. ( entanglement in fishing gear, gunshot wounds, well-meaning humans rescuing an “orphaned” pup who was really just waiting for the mother to return). Although I got much satisfaction in helping individual animals, I wanted make more of a contribution to the population. I wanted to learn more about them, and our impact to the marine environment, and to educate the public. So I decided to go back to school to get the training and skills needed to examine the problems and help with solutions. Q: What experiences and opportunities have shaped your path to where you are now? A: During the time I was running the flower shop, I finally discovered what I really wanted to do–to study marine biology. But since I couldn’t just quit my work, I volunteered whenever I could (wildlife rehabilitation), attended lectures and seminars about marine mammals, soaked up every bit of information I could on marine biology, SCUBA dived to get into the water, and took night classes to complete prerequisites until I could go back to school. All my volunteer and work experiences have given me valuable insight into what interests me and has shaped my winding path to graduate school- wildlife rehabilitation, lab work, field research with seabirds, leading whale watch boat trips, teaching marine science to kids and undergraduates. Originally I thought I might study seals, or veterinary medicine, but while leading whale watch trips I realized how many more seabirds there are out on the water, and became intrigued by them, and how they make a living almost entirely at sea. After interning as a seabird research assistant on Southeast Farallon Island, I was hooked on seabirds. Every internship or volunteer opportunity has revealed to me that there are so many more opportunities and fields of study than I had imagined– you just have to jump in and get involved. Even courses I’ve taken have been building blocks for my journey. Q: What are you studying and why do you find it interesting? A: Seabirds are way cool! They most visible predator in the marine environment, but most people never see them. Because of that lack of visibility, negative impacts on seabirds often go unnoticed. I want to use my research with seabirds to learn more about how they find their food and to inform people about and raise public awareness of seabirds. For my thesis project, I am examining the satellite tracks of sooty shearwaters (a seabird we can see off our coast in the summer) and correlating their movements with physical environmental factors (remotely sensed winds). The birds are hypothesized to be attracted to upwelling retention areas, which can be calculated using wind data. I’ll be refining my Matlab programming skills (that I was introduced to as an undergrad, and developed further at MLML) to analyze physical oceanographic factors to help understand how the seabirds are moving around in the California Current. I think this is cool because I always wondered how seabirds find their food in a plane that looks, so us to be non-descript- I know I couldn’t navigate without GPS! Q: What are you hoping/planning to do when you finish? A: I would like to continue research with seabirds and understanding how they use the ocean, and to continue introducing others to nature with education and outreach. If it had not been for a good friend who took me out hiking in the woods, and introduced me to the birds, bugs and wildlife, I would not have pursued an education biology. I realized the importance of bringing others closer to nature, to allow others to develop a personal relationship with nature that hopefully fosters care and conservation of our environment whether its terrestrial or marine. -Find out what you can about the system or organism you are interested in. Attend lectures and workshops related to the subject, talk to people in that field– I found that there are way more kinds of opportunities than I imagined. Check out local universities or organizations for seminars open to the public. -Get hands-on experience by volunteering or interning, working on a boat, etc. It’s just as important to figure out what you don’t like as what you do like! This will give you a better sense of what the work entails and how it suits you. For example, whether you like to be in the field (in Alaska or the tropics), or prefer to do work inside (doing test in the lab, genetics, etc), or on a rocky boat or on solid ground. You’ll get to know people in that field, which can help you with getting future work or recommendations. This will build your list of references for applying to grad school, work or for scholarships. -Do a senior thesis if you can- it gives you great experience and potential grad schools like to see it. You learn so much by going through the process, and gain more confidence. Q: What are the most challenging and rewarding aspects of being in graduate school? A: For me, the most challenging aspects of graduate school has been balancing school and family responsibilities- I have a two-year-old daughter that keeps me very busy! I started MLML when she was 6.5 months, and I could only afford to go to school part-time, because the cost of infant care was prohibitive. I have to keep focusing on what opportunities I can participate in instead of what I cannot do because of my time commitments. I would not say you can’t be a mom and do graduate school- you can do both, but it involves a lot of planning! Believe me, if I could have, I would have done graduate school before having a kid. I feel very fortunate to have the opportunity to attend graduate school. Yeah, it’s hard work, but don’t get me wrong- I love where I am today. I know I am doing what I really love and that it is preparing me for the next adventure life has in store for me. In the process I hope that I am setting a positive example for my daughter, showing her that you can do whatever you set your mind to doing.